One of the best things about SEO is, you get access to so many SEO tools which are ranging from free to premium. But the only unfortunate thing is that it’s almost impossible to tell the best SEO tool (when you’ve too many choices). If you’re following Bloggers Passion for a while, you already know that we love SEMrush tool because of its ability to perform everything from keyword research to backlink analysis to site audits and many more. But it’s bit expensive which costs you around $99.95 per month. Click This Link if you want to give a try to SEMrush Pro Version worth $47 free for the next 14 days before moving to its alternates. You can read my unbiased review of SEMrush from here. So if you’re looking for top SEMrush alternatives, this post is a treat for you where you’ll discover top 10 best alternatives to SEMrush. Let’s find them out. Ahrefs is quickly gaining popularity among leading SEO tools and it is undoubtedly one of the most popular SEMrush alternatives. You can perform everything from backlink checking to keyword analysis to competitor research with accurate data (read complete review). What makes Ahrefs a unique SEMrush alternative? Here are a couple of benefits of using this SEMrush alternative called Ahrefs tool. Let’s explore about some of the metrics that Keyword Explorer offers you. Keyword difficulty: Ahrefs keyword difficulty score is what tells you how hard it is for you to rank for a keyword. It is calculated between 0 to 100 and 100 being the hardest to rank for and 0 being the easier to rank for a keyword. So while doing keyword research, this metric plays a key role to pick low hanging keywords (as a rule of thumb, pick those keywords below 50 KD). Search volume: It also shows you the search volume of any particular keyword that you’re trying to rank for (along with the clicks that the top results are generating for that particular keyword). It also shows you paid ads, volume along with the clicks for the keywords you’re trying to rank for on Google search. Keyword ideas: You can generate so many keyword ideas that are relevant to your primary keyword idea which allows you to find Phrase match, Having same terms; Also rank for; Search suggestions (autosuggest) to come up with more relevant keyword ideas. You can easily find the most popular and shared content for any topic using Ahrefs content explorer feature. You can easily find the popular content by seeing the following metrics. Social shares: These social shares data include social networks like Twitter, Facebook, LinkedIn and Pinterest. Organic search traffic: This helps you to analyse how many visits a given article is generating from search each month. Referring domains: This tells you how many unique websites are linking to that article that you’re looking for. 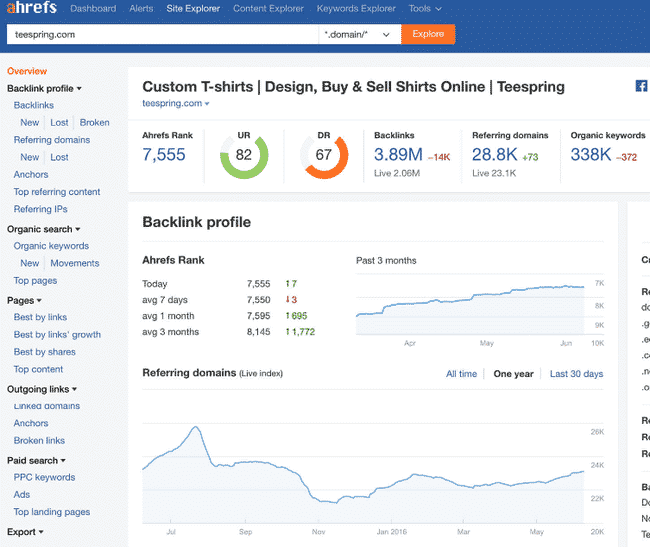 If you want to find out the backlink profile or organic search engine traffic of any website in the world, you can use Ahrefs site explorer tool to do that. It gives you the most accurate information (I know it because I use several SEO tools for keyword tracking, analysing backlinks, estimating search traffic of a site etc) possible. Let us now quickly talk about how the above metrics from Site Explorer can help you easily analysis any website in the world. Total backlink count: You can find all the referring domains along with the links (both dofollow and nofollow links) of any website that you want to analyse. You can easily find new backlinks, lost backlinks and broken links of any particular domain. You can also find out the content that’s generating more number of backlinks. Organic search traffic (along with the keywords): You can get the list of all the keywords that are generating traffic to a site or domain from search engines. You can also easily analyse all the progress of any particular website for specific keywords. You can check which pages of a website or domain are getting more traffic from search. You can also find all the competing domains and pages that are ranking for the same keyword on search results. Outgoing links from the site: This gives you a list of all the domains and websites including URL’s that your targeted website is linking to (along with the anchor text information). You can also easily find if any of their outgoing links are broken or not (so you can use the broken link building strategy to build quality links from that site) that you can also use as SpyFu alternative. Paid search metrics (PPC keywords, ads etc): You can easily find all the paid keywords that your targeted website is using on Google AdWords to get more visitors, leads and sales to their sites. You can also find out all the ads that are showing up on Google search for any of your targeted website or domain. Ahrefs is the #1 keyword research tool used by SEO experts like Neil Patel, Brian Dean etc. Ahrefs offers 4 pricing options which are mentioned below. Let’s talk about them now. Lite: This is the basic plan which costs you $79 per month where you can create 5 campaigns, add 1 registered user and track 300 keywords. Standard: This plan costs you $179 per month but perfect for bloggers who want to grow their search engine visibility where you can create 10 campaigns, add 1 registered user and track 1,000 keywords. Advanced: This plan costs you $399 per month where you can create 25 campaigns, add 3 registered users and track 4,000 keywords. Agency: This is their most advanced plan which costs you $999 per month where you can create 100 campaigns, add 5 registered users and track 10,000 keywords. Serpstat is one of the best and affordable alternatives to SEMrush that you can use to perform competitor analysis, keyword research, position tracking, site audit and backlink research with ease (full review here). Why should you go for Serpstat? Here are some of the reasons to consider this SEMrush alternative i.e Serpstat. Serpstat is an all in one SEO tool that can be used for so many things including keyword research to link analysis but the major reason to go for it is the ability to perform a thorough audit of any website and even each page of the website separately. Quick note: You can control how frequent you can perform site audits using Serpstat. You can do it daily, weekly or monthly to find and fix all your website SEO related issues to get better search rankings and give better experience to your website visitors. Discover all your lost backlinks: If you’re into SEO for a while, you know the importance of backlinks, right? Building backlinks is critical however you also need to keep an eye on your lost backlinks. Only then, you can maintain a great link building strategy to keep track of all your links to increase your overall SEO rankings. But how do you keep track of website lost backlinks? Serpstat lets you find all your lost backlinks with ease so you can find ways to reclaim your lost backlinks. You can simply use their Backlink Analysis feature and when you click on “Lost Backlinks” section, you’ll find a report which contains all of the backlinks of your site that are lost over the last 3 months along with linking URLs, acceptor URLs, anchors, link type, flow metrics and the date of loss at one go. Website loading speed issues: If you don’t know what causing your website speed to load slower and if you’re looking for ways to increase your website speed, Serpstat website speed feature can help you with that. You can easily find out all the details like image optimization, browser caching, compression errors etc to speed up your loading times. Identify excessive redirect issues: You can use Serpstat site audit feature to find all the redirect issues your site has. You can find all the redirect issues including 301, 303 redirect issues etc and direct them into the destination page with direct links. Identify duplicate content or pages: With Serpstat site audit feature, you can easily find all the duplicate (or repeated) title tags on your site so you can either remove them or update those title tags with unique titles. You can also find all the images with missing alt tags, missing meta description posts, lengthy title tag errors etc. One simple way to get rid of your duplicate content such as repeated title tags or meta description is to set meta tags «rel=canonical» and «meta name=”robots” content=”noindex, nofollow”» on the duplicate pages otherwise, you can simply use Google’s Disavow tool to get rid of bad content or links from your site. Find broken links: If your site has 404 error pages (also known as dead links or broken link pages), it can literally hurt your SEO rankings and even lead to site penalization if they are excessive. Here’s where Serpstat site audit feature helps you find all the broken links of your site so you can easily fix them or redirect them to some other working pages on your site. Whether you agree it or not, keyword research is the key to getting better search rankings on Google. With Serpstat, keyword research becomes much easier as it has databases of every country of the world and increased their number of analyzed domains. Its Google USA database is 2.4B now, which is rather more than SEMrush’s one. Also, here you find a ton of long tail keywords, LSI keywords along with the search volume and all the other relevant information and keywords to grow your search traffic and this also works exactly like a great Keyword Spy alternative. Search volume: This tells you how many people are searching for the keyword monthly so you can filter low competitive keywords easily. CPC: Also known as Cost Per Click which tells how profitable your keywords are. The high CPC a keyword has, the more money you can make from using and ranking for those keywords. Apart from the above features, here’s a list of all the features that you get with this great SEMrush alternative for 2019. Here are some of the key feature of this SEMrush alternative known as Serpstat. Plan A: This is the basic plan that costs you $19 per month where you can perform 300 queries per day and you can track up 200 keywords with this plan. This plan is better for starters and who want to explore more about the features of Serpstat before jumping into the advanced pricing plans it offers. Plan B: This plan costs you $69 per month where you can perform 4000 queries per day and you can track up 700 keywords with this plan. You can perform in-depth SEO analysis with these plan’s features and limits. Plan C: This plan costs you $149 per month where you can perform 6000 queries per day and you can track up 2000 keywords along with chat support with this plan. Plan D: This plan costs you $299 per month where you can perform 8000 queries per day and you can track up 5000 keywords along with phone support and chat support with this plan. SpyFu is considered as one of the most powerful SEO tools for keyword research. You can do everything from keyword research to PPC analysis to influencer marketing using SpyFu SEO tool which makes it one of the best affordable alternatives to SEMrush. Why should you consider using this SEO tool? Here are the 3 major features that makes SpyFu one of the best alternatives to SEMrush tool. With SpyFu, you can easily perform expert level research for finding profitable keyword ideas that can increase your search engine traffic and website sales. Discovering the new keywords that are profitable is the key to generate more sales to any website. With SpyFu keyword tools, you can easily find long tail keywords by keyword volume and keyword difficulty. SpyFu has a special feature called Kombat which you can use to find all the profitable keywords and ad keywords used by your competitors. If you’re still struggling to increase your traffic and sales and if you want to uncover all the hidden keywords used by your competitors on their sites to boost their sales and traffic, Kombat is a great addition for you. PPC keywords are those keyword elements that you or your competitors use for PPC (Pay Per Click) advertising and they are also known as AdWords keywords. Finding profitable PPC keywords is the key to generating more clicks and sales within a limited budget. Here’s where SpyFu PPC keyword research can help you with it where you can quickly get any website’s PPC keywords for direct answers about what to add to your own PPC campaigns and get new ideas and estimate costs for those PPC keywords to save more and get better results from search. SpyFu offers 3 pricing plans which are listed below. Let’s briefly talk about their pricing plans now so you can choose which plan works best for you while considering SpyFu as the best SEMrush alternative. Basic: It’s the basic plan that costs you $33 per month (billed annually) and you can do unlimited keyword searches, data exports along with 250 sales leads & domain contacts, 5k weekly tracked keyword rankings and 10k top lists results. Professional: This is perfect for medium sized websites and professional bloggers that costs you $58 per month (billed annually) Apart from those features, you’ll also get 500 sales leads & domain contacts, 15k weekly tracked keyword rankings, 50k top lists results along with 10k API rows returned. Team: This can also work like a Keyword Spy alternative that costs you $199 per month (billed annually) where you’ll get all the features from Professional plan which is stated above. Apart from that, you’ll also get access to 2000 sales leads & domain contacts, 40k weekly tracked keyword rankings, 75k top lists results and 10k API rows returned with this plan. If you’re not happy with their features or pricing, you can cancel anytime via Email, Livechat, or Phone and SpyFu also offers 30 days money back guarantee (no questions asked). It is one of the fastest growing SEO companies that offers a lot of SEO tools which you can use to do everything from keyword research to SEO analysis to technical audits. It is also a great SEMrush similar alternative you can use to grow your traffic. What’s so special about this SEMrush alternative called Web CEO? Web CEO SEO tools offers excellent keyword research features with unlimited keyword suggestions and that’s what sets apart this tool from its rivals that put limits on the number of keyword suggestions. It also gives you local SEO keyword suggestions if you want to rank for local keywords. This is best suited if you’re running an eCommerce store or creating an online business to collect leads and emails in your local areas. You can also perform competitor keyword analysis using their tool where you can find a ton of relevant and highly profitable keywords that your competitors are ranking for. This information can be really useful to know your competitors keyword strategies and outrank them easily with your own SEO strategies. You can also perform technical SEO analysis where you can find all the issues, errors, warnings, broken links etc on your site to improve your user experience and site’s visibility in search engines. One of the great things about using Web CEO SEO tools is that it gives you a DIY checklist with every pricing plan. These checklist include everything from keyword research to backlinks to SEO to social media promotion. For instance, you can use their blogging checklist to find effective ways to promote your content to get wide reach, social shares and links to your content. So let’s now talk about some more features of this SEMrush alternative so you’ll get a better idea about whether it’s worth your money or not. Moz Pro is the industry leading SEO package which gives you access to a ton of amazing SEO tools. Moz Pro helps you perform a great keyword research to link analysis to page optimization with ease. What makes Moz Pro a better SEMrush alternative in 2019? Here are few of the features that Moz Pro a better alternatives to SEMrush. One of the most useful things with Moz Pro is that its page optimization score. Just enter a keyword that you want to track and analyse the results along with the URL for the original blog post (your own page URL or your competitors) and when you hit the analyze button, the tool will generate a page score of up to 100. 100 being the best optimized post. If a page is poorly optimized, it will give a low score along with the recommendations and also content suggestions to improve the page score further (by also helping you boost your search rankings of the keyword that you want to rank for). If your score is good, pick another keyword along with its URL and keep on improving your pages. If not, solve the recommendations along with the content suggestion the tool provides. It’s as simple as that. Moz Pro which also works like a SpyFu alternative offers an incredible feature called Site Crawl Test which helps you easily audit any of your website to find and fix all the SEO related issues to boost your search rankings and traffic. This feature basically deals with all the website related SEO issues such as duplicate content and titles, server redirects, errors in the title tag or URL, meta descriptions, pages that are blocked with Robots.txt, rel=canonical etc. So it doesn’t matter which technical website SEO related mistakes your site has, you can easily find and fix them. You can also set crawl alerts to get instant notifications to your email whenever your site faces new technical related issues (dead links, missing meta description, lengthy title tags etc) so you can better optimize your content all the time. Apart from the above benefits, Moz Pro has a unique benefit which 99% of the other SEO tools don’t offer and that is giving you access to their Q & A forum. It’s a community of Moz associates and SEO experts where you can get information about SEO and find solutions to your website SEO related needs. You’ll get access to a ton of SEO related information to boost your search rankings, results and website sales by getting access to their Moz Q & A forum. You’ll also get 24/7 support so if you ever stuck, you are just click away from getting help and support from their support staff. Here are some of the features of this SEMrush alternative. Moz Pro offers 4 pricing options which are listed below. Let’s briefly discuss about them now. Standard: If you’re just starting out and want to try their SEO tools and features, this plan is best for you which costs you $99 per month with limited features. Medium: With this plan, you’ll get full access to their keyword research tools without any limits which costs you $149 per month. Large: If you’re running a small business and want to grow your presence on search engines like Google, this is the best plan which costs you $249 per month. Premium: This gives you premium features like massive crawl budget, and unlimited user seats per account and costs you $599 per month. Moz Pro has a 30 day money back guarantee and it also offers a free account for every registered user to Moz tools that give you limited access to MozBar, Keyword Explorer, and Open Site Explorer for backlink research. You can find the list of all Moz alternatives from here. Majestic is one of the biggest SEO tools which crawls over millions of URLs worldwide and has the biggest backlink database repository to help you improve your SEO which can also be used as SpyFu alternative. What’s special about Majestic SEO tools? With this SEMrush alternative, you can easily explore and analyse all the details of your own domain or your competitors domains. It gives you details about the link quality, trust flow, backlinks, anchor text, page information etc. Here’s how it look like. It gives you all the details of any domain you enter along with the topical trust flow, link quality, citation flow etc. Majestic has the world’s largest backlink database index which crawls millions of URLs each month and you can also use their bulk backlink checker to analyse hundreds of backlinks at once. Lite: This is the basic plan from Majestic which costs you $49 per month which is ideal for starters and domainers who want to get as much information as possible about domain backlinks, domain trust flow etc metrics. Pro: This costs $99 per month and ideal for professional bloggers, small businesses and SEO enthusiasts. API: This is their advanced plan which costs $399 per month and perfect for agencies and developers who want to get more information about links and can register up to 5 users per account. Majestic offers 7 day money back guarantee and it also offers free chrome and firefox extensions for all the users to analyse backlinks of a site (with limits). It is considered as one of the most trusted SEO tools for keyword research, rank tracking and competitor analysis which is used by thousands of SEO experts worldwide. What makes Wordtracker a great SEMrush alternative? Wordtracker is known for generating thousands of highly profitable keywords in any industry. You can use it to do keyword research for your own sites, YouTube videos or Amazon affiliate product websites etc to bring more traffic from search engines and improve your website sales with ease. The main difference between using this amazing SEMrush alternative is, it comprises the keyword data not only from Google but also from other sources like YouTube, Amazon etc. BuzzSumo is one of the top SEO and social media tools used by millions of users worldwide to find popular content, find backlink opportunities, influencer outreach, brand monitoring etc. Why should you use BuzzSumo over other tools? Hands down, creating great content that’s proven to work is the fastest way to generate more traffic and sales to any website. Here’s where you need to find proven content that goes viral but how can you figure out which content performs well? Well, with BuzzSumo the answer is easy. You can find popular content in any industry by sorting out the backlinks, social media shares etc. Just enter a keyword or topic of your choice and it will give you all the articles, videos, links or other content with more social shares and backlinks so you can easily pick a topic for your content creation. To put it simply, BuzzSumo is a great tool for all content creators to find high performing content in any industry so you can create highly shareable and link worthy content without wasting your time and energy. Majority of the people use BuzzSumo for influencer marketing. We all know how important and essential it is to network with the influencers. Just one tweet from a popular influencer in your industry can literally change your online fate. If you’re still not doing it, you’re making a big mistake. With BuzzSumo, you can find and analyse influencers in any industry with ease. Just enter a topic or keyword to find all the influencers in your niche to start networking with them. BuzzSumo has great filters to easily filter out all the influencers and sharers by reach, authority, influence and engagement. Which social media sites are generating more shares to your competitors etc. This SEMrush alternative also has the following incredible features. Not considered as an all in one SEO package like Moz Pro, SEMrush etc. Currently BuzzSumo has 4 pricing plans. Pro: This is the basic plan that costs you $79 per month where you can run unlimited content searches and get alerts for up to 5000 mentions. Plus: plan that costs you $139 per month where you can run unlimited content searches and get alerts for up to 10,000 mentions. Large: plan that costs you $239 per month where you can run unlimited content searches and get alerts for up to 20,000 mentions. Enterprise: plan that costs you $499 per month where you can run unlimited content searches and get alerts for up to 50+ alerts and unlimited mentions. This is a great alternative to SEMrush which you can use to perform SEO related tasks, social media tasks and PPC with ease. Is Raven tools a great SEMrush alternative? Raven tools link manage helps you easily monitor all of your backlinks at one place so you can eliminate all the bad links that are causing your site damage in search results. Even it notifies you whenever you get a new incoming link to your site or you’ll get notified whenever someone removes a link to your site – this will be handy in managing all your backlinks profile effortlessly. The great thing about using Raven tools is that it uses the solid data from incredible SEO tools like Majestic, Moz, Google AdWords and OpenCalais to give you great information about keywords, backlink and competitor analysis (so you don’t have to pay for those premium tools by getting access to Raven tools). Let’s quickly discuss about this SEMrush alternative pricing plans so you can find the best package that suits your budget and website needs. Raven tools is also works sites like SEMrush. Start: is the basic plan that costs you $99 per month (billed annually) and you can add up to 4 users and it supports monthly crawls up to 400k. Grow: costs you $169 per month (billed annually) and you can add up to 8 users and it supports monthly crawls up to 2 million. Thrive: costs you $249 per month (billed annually) and you can add up to 20 users and it supports monthly crawls up to 5 million. Lead: costs you $399 per month (billed annually) and you can add unlimited users and it supports monthly crawls up to 7 million. Are you looking for sites like SEMrush?If yes, SEO PowerSuite is for you which is a powerful set of all in one SEO tools package which gives you access to keyword research, backlink analysis, site audits, rank tracker etc at affordable prices (Read SEO PowerSuite Review here). Why use SEO PowerSuite as an alternative to SEMrush? SEO PowerSuite is a SEO tool package which gives you access to 4 amazing tools at one price which include the following. Rank Tracker: You can get accurate results about where your keywords are ranking on Google search. It includes all the details like ranking data, keyword research, ranking reports, scheduled tasks etc. SEO SpyGlass: You can use this tool for backlink audits and competitor analysis. You can figure out all the backlinks of a site, perform anti-penalty audit and get backlink reports etc. Website Auditor: You can use this tool as a SEMrush similar tool for site auditing and complete on site SEO analysis. If you want to get higher rankings and optimize your keywords without getting penalised on Google, this tool can be so handy for you where you can perform website health check, page content optimization and crawling and indexing with reports. Link Assistant: If you want to control and manage all your backlinks at one place, this tool is useful for you. If you want bad links or broken links, you can use this tool to find and analyse all of them. Apart from free version, this SEMrush alternative offers 2 pricing plans where you can get lifetime access to their SEO tools. So far we discuss about some of the cheaper SEMrush alternatives for your SEO needs but we still consider SEMrush is one of the best (if not the only best) tools for all your marketing, SEO and website needs. Quick tip: Here’s an exclusive link to SEMrush where you can get 14 days free trial worth $47. Site Audit: With SEMrush site audit feature, you can easily find and fix all your website issues which includes duplicate content, no alt tags, missing meta description, broken links, redirection errors etc. Keyword research: We use SEMrush mainly for keyword research as it’s one of the top tools for finding great keywords which also provides metrics like search volume, relevant keywords, backlinks information etc all at one place. Competitor analysis: SEMrush became popular because of its ability to perform competitor research with accurate information. Want to know your competitors search traffic? Want to know any website’s traffic? Want to know where your competitors are generating their backlinks from? You can get all that information using SEMrush. SEMrush vs Ahrefs: Which is best Tool? Moz vs SEMrush: which is better SEO tool? Spyfu vs SEMrush: which is better for competitor research? So there you go. Those are the top 10 best alternatives to SEMrush. Although we love SEMrush and highly recommend for everyone who wants to increase their search traffic and sales but we still thought there are some more rocking tools that are worth giving a try. Did you find the above mentioned SEMrush alternatives useful? Or did we miss anything from the list? Share your thoughts in the comments and let us know your favorite SEMrush alternatives for 2019. I bought Ahrefs after reading this. Thanks for recommendation. Yes, it’s true that both Ahrefs and SEMrush are great for keyword research. Not only finding better keywords but you can use these both tools to do so many other things including competitor analysis, backlink research and so on. SEMrush is definitely one of the best tools out there. It is also true that this is quite expensive compared to others. However, according to me, ahrefs is a good alternative to SEMrush compare to its functionality and features. Thanks for sharing this awesome post. when it comes to semrush alternative Ahrefs tool is one of the best. Although Ahrefs is expensive compared to other. Thanks for mentioning all the great SEO tools. i think Ahrefs is the best alternative of SEMrush because it’s help to find backlinks data more accurately. these tools are very helpful i have an question in your 10 tool what tool is most useful for a marketing blog. If you can afford, I would suggest you go for SEMrush. I personally use Serpstat and Ahrefs as top alternatives to Semrush. Serpstat is the cheapest and the most affordable tool I`ve ever met. But Ahrefs has definitely the most accurate backlink data. Thanks for the great review on such number of SEO Tools. I am going to select from here list and buy soon. Let me make the right decision. Once again thanks for the review. Thank you for the nice article. Can I use the trial version of SEMrush tool to find keywords without having credit card? By the way, you are the famous blogger from India. Best wishes for you. You have to share your credit card details before giving a try to SEMrush for free. But you can cancel your membership with them anytime if you are not happy with their SEO tools by sending an email at mail@semrush.com.